It’s Christmas time of the year again and I’m sure there are plenty of Christmas offers around various app stores for your many mobile devices, but if you’re looking for some RPG games to keep you entertained for the rest of the year while you enjoy the rest of your school holidays or the remaining of your annual leave, check out some discounted apps from Square Enix. The discount (for selected apps only) is available immediately till 3 January 2013 only so if you wish to get them, do it fast. First up, the original Final Fantasy has dropped from USD$6.99 to USD$4.99 on the Play Store. Unfortunately, the sales only applies to this Final Fantasy title for Android. 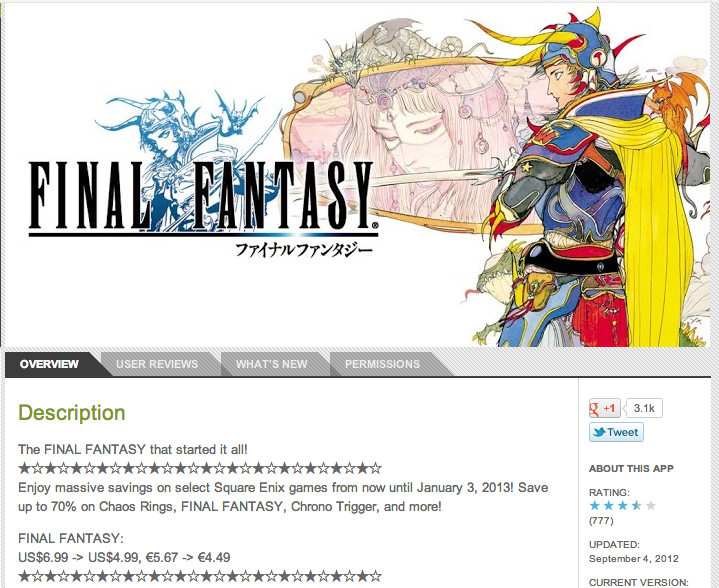 On iTunes, it still cost USD$8.99 and none of the later Final Fantasy series are on sales for either of the stores.